While it's been done before by USA Networks and others, this might be the most relevant dollar bill sticker promotion to date. 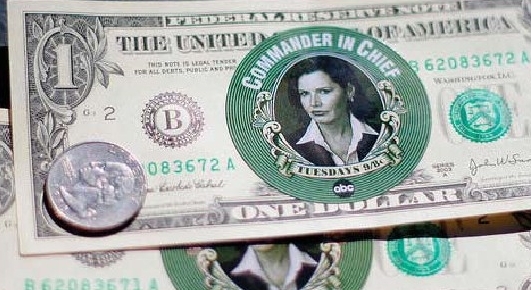 To spread the rod about its new show Commander in Chief, ABC has affixed thousands of dollar bills with the image of Geena Davis, the star of the show who plays the President in the series. A less relevant dollar bill promotion highlights NBC's unscripted series Three Wishes. I think it's time for the FEC to investigate "Commander In Chief"! With four or five of Hillary's advisors on the show's staff, and now they're putting that face on a dollar bill! Come On! If this is not in violation of Election Rules, NOTHING IS!